Highway webcams images showing smoky conditions, captured in August 2018. 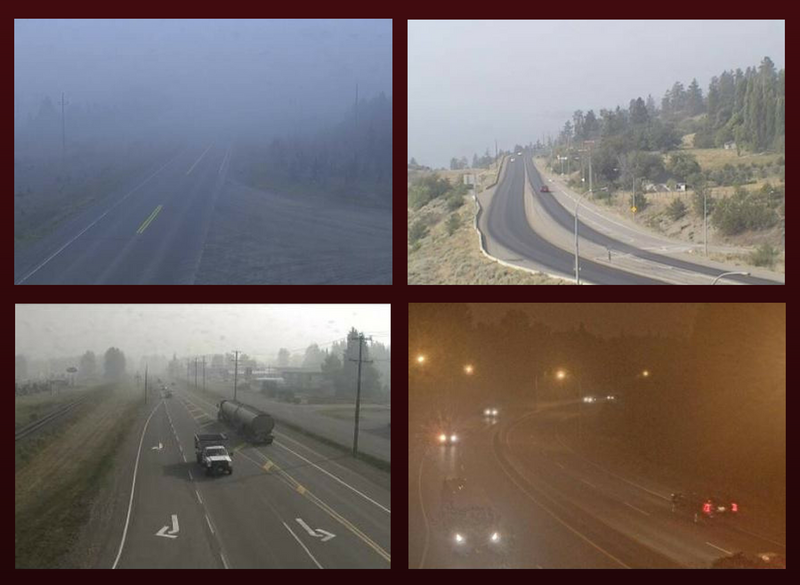 Clockwise from top left: Highway 27 south of Fort St James, Highway 97C north of Peachland, Highway 16 in Prince George at 9:50 am, Highway 16 in Houston. BC wildfires are burning on a massive scale this summer, as a gloomy cloak of smoke is draped across the landscape from inland to coast. The sun has taken on a blood-orange tinge; the air is pungent and thick – so much so that morning can seem like night in communities closest to the worst of the nearly 600 fires blazing in BC. 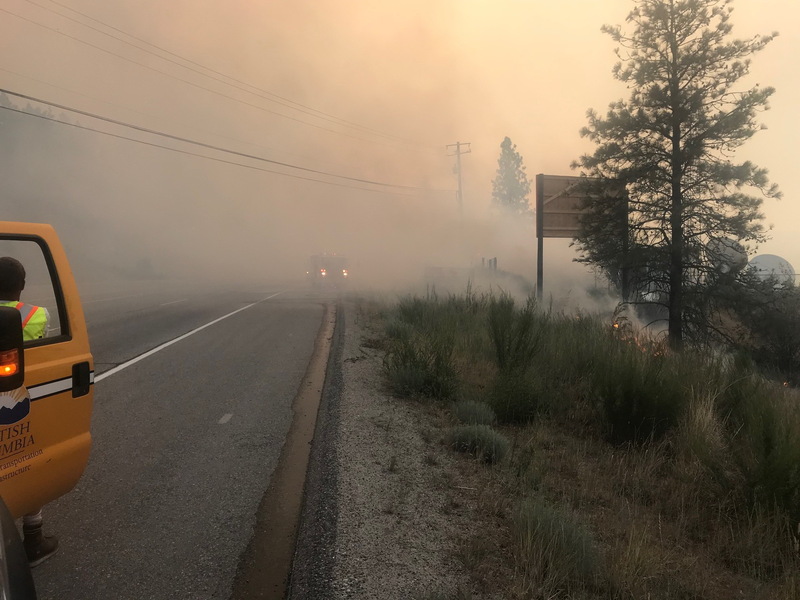 Wildfires are coming precariously close to side roads and highways; some are closed or with limited access, even more have very poor visibility. We want to share a few tips and resources to help you travel safely during wildfire season. Down to brass tacks: Where can I travel? >> BC wildfire impacts to highways, including closures and traffic restrictions, are available via DriveBC. >> Impacts to side roads are listed via TranBC. >> Impacts to forest service roads are here. Usually, it’s the wet, dreary winter months that make visibility challenging. But this constant summer “fog” we’re experiencing now is dimming the lights in a unique way. Sometimes day looks like night, other times it seems like we’re looking at the world through an Instagram filter. >> Turn on your headlights and tail lights. Ideally, we do this every time we’re behind the wheel, but it’s even more important in dark, hazy conditions. Don’t rely on the automatic headlights feature. Keep it simple, turn ‘em on. >> Keep your eyes on the road, and avoid distractions. Again, this always applies, but the smoke is dramatically reducing stopping sight distances on the roads, reducing drivers’ reaction times. >> Don’t gamble by passing on two-lane, two-way highways when long-range visibility is reduced. Wait for a truck climbing lane or other multilane section to pass. >> Slow down. Remember: posted speed limits are for ideal conditions. A smoke screen is not ideal conditions. >> Give more space to the vehicle ahead of you. Bad visibility can lead to abrupt stopping as reaction times are reduced. And let’s face it, no one likes a tailgater. >> Top up your wiper fluid. That white stuff falling from the sky? Yeah, those are ashes, not snowflakes. Don’t let a dirty windshield make your view of the road worse. >> If you have to pull over for any reason, make sure you are completely off the road with hazard lights flashing. >> Only drive if you feel well enough to do so. Forest fire smoke is a mix of gases and small particles that can irritate the respiratory system, and the poor air quality is affecting some people’s health more than others. If you feel exhausted, dizzy, or impacted in any way that could reduce your ability to drive, best not to get behind the wheel. Here’s more information from the BC Centre for Disease Control about how to protect yourself from poor air quality. Crews battle a wildfire near Antlers Beach Regional Park on BC Hwy 97 near Peachland. There is no end in sight to the wildfires ravaging BC. But life goes on, which means goods are still flowing and people continue to travel. Let this be clear: safety is our biggest concern. Closures will continue on highways and roads deemed too hazardous for travel. It’s important to keep informed about road conditions, closures and restrictions, and adapt our driving behaviour to stay safe despite the smoke. If you spot a wildfire, please report it to the BC Wildfire Service at *5555 (a map of active wildfires is available). Residents of areas impacted directly by wildfires can view a list of community and regional district evacuation orders, alerts and rescinds at EmergencyInfoBC. Do you have any wildfire season travelling tips worth sharing? Please do – there’s a comment section below. Thank you for the up to date info and tips. Traveling this Friday on the following route: Tok, Alaska- whitehorse – Watson lake – fort Nelson – grand prairie – Airdrie – Great Falls Montana. Not seeing any closures on that route at the moment, anything I am missing? Thanks for checking in with us. No, you’re right there are no closures at this time on the Alaska Highway/(BC Hwy 97) in BC. (I can’t speak for Alaska, Yukon, Alberta or Montana). During wildfire season, things can change quickly so please check DriveBC.ca http://www.drivebc.ca/mobile/ to know before you go, and during breaks along the way, while in British Columbia. are any railway lines affected by the fires and smoke? Unfortunately, we can’t confirm which, if any railway lines are impacted by the current wildfire situation in BC. Please connect with the railway line directly for more information on this. Thanks and safe travels!